Colin is currently designing and delivering programmes for leading organisations in the UK, Europe, Hong Kong, China, Malaysia, Singapore and India……………….the feedback from clients is exceptional. Clients has worked with include senior staff from AIG Taiwan, Interface.Inc., Philips Electronics, British Glass, NHS (UK), Malaysia Telekom, Taj Hotels (India), DHL, Kingfisher Airlines (India), Bharat Petroleum (India), Intercontinental Hotels (Global), Ekokem Waste Management (Finland), Nomad Adventure (Malaysia), Ernst & Young London, Outward Bound Singapore, Outward Bound Hong Kong, the Singapore Confederation of Industries, Kadoorie Fram & Botanic Gardens Corporation (Hong Kong), B&Q UK, The UK Society for the Education of Anaesthetists, The UK National Parks Authority, and many other global public and private organisations. In October 2018 the CEO of Sparks Consulting in the US, who deliver residential programmes for elite athletes, reported substantial positive changes in the impact of their camps as a result of flying from the US to UK to learn the art of holistic experience design in a 1:1 two day workshop. In Malaysia a Master Class training programme resulted in the following feedback from experienced clients: ‘I wanted to thank you again for your truly inspiring training, which came at the perfect time for me! I’ve been working on evolving my own communication workshops toward a deeper and more experiential approach – and your training has given me so much food for thought on ways to do so; thanks! It was also wonderful to witness your style – warm, gentle, and enthusiastic at the same time’. Another client commented last year: I’ve given much thought to what you’ve shared with us in our previous meeting, and I’ve personally used the concepts that you have taught in the class in my own training as well – and I must tell you that it was amazing! I didn’t have to do much at all except to facilitate the class to make sure that they achieve the objectives of the program. Truly an empowering experience for the participants to be able to discover the answers themselves, which is more meaningful. The following feedback was sent from an organisation that sponsored staff: Both our staff have benefited immensely from your sessions and they have rejuvenated passion as trainers. They have been applying your techniques during our last two courses and have received the highest commendations for facilitation thus far. For and on behalf of Wilderness Malaysia I would like to thank you for your good work. Feedback from Outward Bound Hong Kong 2018 ‘Thoroughly enjoyable and inspiring’ …the positive effect on our programmes as a result of our redesign following your workshop has been substantial’ . ‘We now use some of your methods for our staff training’: Taj Hotels, Training and Development Manager, Mumbai, India. ‘Your training for our trainers has been inspirational’: American International Group (AIG) Taiwan. You always get the highest feedback scores for our staff development programmes: Taylors University, Malaysia. The staff are describing your course as remarkable! Kadoorie Farm and Botanic Gardens Corporation, Hong Kong. Avoid expensive overseas calls: Skype name is colbeard1. (that’s a one at the end!). To be added to the Skype contact list of Colin will require a prior Skype SMS or e-mail contact (see above for e-mail) for consultancy requests. One two or three day programme covering new practitioner models, human experience mapping, innovative learning methods, hands on experiences of powerful approaches to learning, theories made easy, thinking made visible, and great takeaways. Experience a special facilitator in action. (Certificated & Non-certificated) Corporate ‘Experiential Training the Trainer’ – learn the secrets of high levels of learning, retention and transfer to working situations…………..tried and tested with many corporate organisations around the world. Experience first hand: personal profiling, left-right brain issues, understand outsourcing innovation opportunities using a case study from a leading global organisation that Colin worked (part of a European Innovation Team), consider a range of new techniques for idea creation, understand and practice different thinking patterns (higher order, lateral, divergent) product design, exploring product trends through experiencing real market products (simple linear change within and across products, product merging/multiple function design, industrial ecology), develop a ‘new product’ pitch, understand social-spatial knowledge construction – and innovation destruction! (learn new techniques for silencing destructive voices), developing innovative brand ‘signatures’ and experience lots of other innovative techniques. Colin delivers these sessions regularly with senior company managers on the Executive MBA at Cardiff Management School by invitation due to the excellent feedback by participants. To request a sample programme send an e-mail to Colin. Environmental/Sustainability Awareness/Sustainable Development/Industrial Ecology in Practice. Colin specialises in hands-on experiential sustainability awareness by using over sixty commercial and domestic products that promote conversational learning, highlighting innovative ideas for greater environmental impact/carbon reduction/policy making etc. To request a sample programme send an e-mail to Colin. Corporate Learning Spaces/Workplace Design (maximising knowledge creation in the learning economy)….Colin is working at the forefront of space design for maximising corporate learning. Contact by e-mail for more details. Colin runs workshops for Universities across the UK. He has worked extensively on lecturer development, with a variety of learning and teaching units. 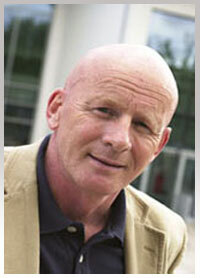 He has also given speeches on teaching and learning at many University conferences. His span of work includes over twenty HEIs, including Reading University, Surrey University, Derby University, Herriot-Watt University, Nottingham University, Aston Business School, Taylors University and Sunway Universities in Malaysia.